Malta is an archipelago located in the Mediterranean Sea. The two main islands are Malta and Gozo. Gozo is more rural as compared to the island of Malta and is home of the Ġgantija temples which, along with the Megalithic Temples of Malta, are the world's oldest free-standing structures and also the world's oldest religious structures. 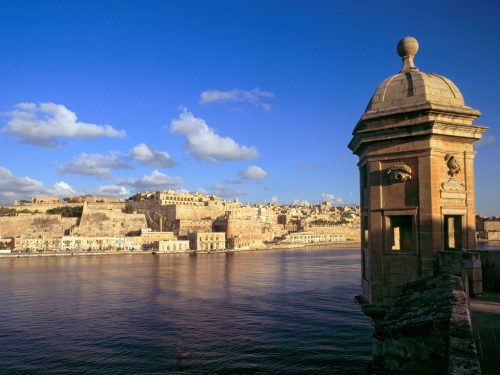 They are great examples of Malta's rich history. In Miss World, the world's greatest beauty contest, Malta debuted in 1965 and reached the semifinals only once back in 1969. Francesca Gaspar will represent Malta in Miss World 2010 she won the Miss World Malta pageant in July. TimesOfBeauty.com proudly presents Miss World Malta 2010 in an exclusive interview for our series Meet the Misses. My name is Francesca and I am 23 years old. I graduated for the first time in 2008 in Bachelor of Honors in Geography with a minor in Anthropology. A year later, I graduated and obtained a post graduate degree as a geography teacher. I am currently working as a senior manager in public relations and corporate responsibility in a national company in Malta. I have been dancing classical ballet for practically all of my life starting from the tender age of three. I have also studied modern dance and drama for six years and completed my London trinity exam for drama specialization. I love reading books mainly about psychology and various cultures that are unusual to the norm. My favorite authors are therefore Torey Hayden and Jean Sasson, both implausible in their true life novels and travels. Furthermore, I do have a daring side to my nature and this is reflected when I set out on my other interests such as diving, jet skis and abseiling. Although I wish to ski dive one day, I don’t think I would ever have the courage to do so. Apart from all this, I do have one passion that stands out before the rest and this is my love for all animals especially dogs. I currently own two dogs which were both found by me abandoned in the streets. Shadow is my female dog and she is so called because she is indeed my shadow wherever I go. Ben is my male dog, so called after our current Pope Benedict. He was found this year when the Pope came to visit the islands of Malta. After a year and a half volunteering at a Sanctuary in Malta, I finally became an official board member with two other girls. My duties are trying to find sponsors, organizing fund raising activities, collecting sponsors, trying to adopt dogs into families, home checks and usual day to day cleaning, medicines, neutering of dogs etc. The sanctuary currently owns 150 dogs all abused and abandoned, we are a non-government organization and our policy is to never put a dog down. The work is a never ending and often heart breaking environment, but we know that if we give up then we would have been failures to these amazing, loving and gifted creatures. My home happens to be a small town in the middle of a vast and spacious Mediterranean Sea. Although we are very small, we hold a lot of history on our backs, since we had always been used as a stepping stone to Africa many many years ago by many different countries. However, it is these countries we have to thank for building through time a unique language known as Maltese. They have also created a culture that is diverse and special to this little diamond surrounded by so many larger ones. My hometown is found on a large hill, central north of the island and it is called Naxxar. People from Naxxar are nosy but friendly and have created a unique dialect of their own that is even hard for me to understand at times, it is a busy town that has the highest percentage of adolescents in Malta that means we have a lot of energy and motivation. My country is small however very convenient, people know everything about you but will always hold a helping hand if you need it. Representing my country is firstly an honor and I would carry my country's name with pride and joy. It means that I am Malta's ambassador and therefore I am responsible for my decisions and actions. I wish that I may be a good example and also an inspiration for the thousands of children and people in need of help and motivation to just survive life or maybe make the right choices. I also wish to show that Malta, although little has indeed a heart of gold. I am currently preparing an on-going project for the sanctuary and wish to include this in my portfolio for Beauty with the Purpose. I do wish to implement Animal Welfare as a cause worth looking in to and helping out. I am of course taking care of my health and body in a more precise manner and at the same time trying to get rid of bad habits that might make me look unprofessional. I will be starting a make-up course soon and also going to traditional dance lessons. Rari- Rare. I did not come up with this word myself because I had so many words that would describe me, however my colleagues at work came up with this word and I thought it might be a good choice. Rare which literally means different and unique. When I did ask them to explain themselves they said: "It is rare to find a beautiful women that are so lively and down to earth . Stay that way!" My dream in life is to build a school for children that suffer from mental conditions. The aim though however is for the school to be a home for abandoned animals. I wish then to combine the loving home for animals and utilize them for therapy sessions with the children. Being inspired by my brother who suffers from Asperger syndrome (a mild Autistic condition), I have noticed through time that children with such conditions (and others such as schizophrenia, attention deficit disorder, hyperactivity disorder) react so well when they have animals around them. They find them fascinating and feel the sense of belonging and responsibility to take care of them. I believe that animals and children are a great therapy and that it can achieve incredible results. I wish that in ten years this dream would become a reality and I would be in charge of this inspiring school of thought. Being beautiful and rich is of course an ideal situation when you look at it from a quick solution in life. However this image that is portrayed looses a lot of meaning in the reality of existence. Coming from a middle class family, I have met people throughout my life from all types of classes and backgrounds and it is my believe that personality has nothing to do with money or lifestyle . You are born with roots which you then choose to develop in to a better and smarter person. Being poor is a situation in life, being smart is a choice that one makes. And by smart everyone can have their own perspective of what being smart means. To me being smart does not mean going to school and achieving a degree. It is about being educated and learning through listening. It is about taking every experience in life, whether bad or good and learning from it, so that when the situation arises in your life, you will be able to handle it in the best way possible. Therefore, I would without a doubt be poor and smart. 8. Which well-known person from your country you most admire and why? I admire Shanel Debatista , Miss World Malta 2009 for continuously smiling and taking the challenge in Malta to be a well known model and beauty queen. It is a hard struggle for a country with a small modeling market to get noticed and popular and most of all to develop such a career. However, Shanel had made it and has been an inspiration to me and many other girls alike. I would choose to live in the New Guinea islands because I remember a fantastic article that I had read about the anthropology of these amazing tribes people on some of the islands. First, they live without time or calendars but they still manage to meet with other tribes at the same time of year to exchange necklaces and bracelets made out of sea shells passed from generation to generation across tribes. Apart from that their is a lot of volcanic activity which is quite a study site to see. In addition, these islands are home of a species of dogs called ‘New Guinea Singing Dogs’ that are unique to other types of dogs and their melody has been sung for more than 6,000 years. These are things that really interest me and it would be great to wake up in the morning and open my window to a world of culture, tribes and the beautiful sea all around me. I believe that through education we may reach a lot of children that eventually will teach future generations. Hopefully this would be an everlasting growth of wisdom and concern. Ultimately they would learn to live a way of life that would be constructive for all the issues we are facing today. Apart from education, together we need to raise further awareness and increase in activities so that this will be a priority rather than just a way to help and volunteer. By implementing it in to our lives, we will then make changes and everyone should not feel as though they were assisting the problem but solving it. I think that a beauty queen should express her personal views. However, she should realize that in doing so she will be answering a question based on just one point of view. Therefore it is okay to express your views because it reflects ones personality but it is important to be diplomatic and realize that other interpretations should also be considered and expressed, in order to justify the opinion of everyone in relation to their situation. I look forward to traveling to China and the other places to see a place that has always been on my ‘Bucket list’. Seeing the Great Wall of China and meeting people that may teach me new things about the world is fantastically exciting. I am very interested in the culture and activity of the Chinese people and also am definitely looking forward to tasting food, meeting significant people and relishing in our activities. Of course another addition would be taking part in Miss World, meeting 120 girls from all around the globe and having a chance to be part of fundraising activities for many people in need. Aishwarya Rai, Miss World 1994. Apart from being immaculately beautiful and having a warm smile that attracts you instantly, she is a person that always seems to keep her family as a priority. She also flourished ever since she won the title and has been prosperous in a career she has always wanted to be successful in: acting. Aishwarya Rai was also the brand ambassador for the eye bank association of India’s nationwide campaign to promote eye donation in India. She also became a brand ambassador for pulse polio, a campaign established by the government of India to eradicate polio. She did other charity events like performing at the HELP concert to raise money for the victims of 2004 Tsunami earthquake and many more. She is indeed an inspiration for so many women by continuing in the career and also remembering to help society in the way that is virtuous for her. She was also on the popular Oprah show and Tyra Banks show where she really showed her through personality by being a simple and gracious women but also very successful. A true Miss World and role model! Beauty with a Purpose means what a beautiful person should represent. This is the ability to love, be kind and help others without feeling as if it were mandatory. It is a special commitment that one has chosen to help others or form part of a something that makes you as a person less selfish and more giving. For me personally Beauty with a Purpose is a chance to discuss implementations of laws in Malta that would allow positive outcomes for general animal welfare. The problem with hundreds of abandoned and abused dogs is so great, that sanctuaries and shelters are forced to put many healthy dogs down. This problem mainly occurs because dogs are not being neutered so endless amounts of puppies and dogs are left in boxes, outside sanctuaries, abandoned areas and other horrifying situations where they just simply die a slow and torturous death. Dog fighting, dogs used for protection and hunting rabbits results in hundreds of dogs being tied to small chains in closed garages for practically their entire life. Life at the sanctuary is also a harsh one because although they are given basic food, water and shelter, many dogs fight and compete for territory and food. Loving them, taking care of them and trying to obtain food, medicine, homes and space for them is what we continue to struggle with. I wish that by winning the Beauty with a Purpose title, I would have enough influence to implement laws for all animals in Malta and introduce heavy penalties if they were to be disregarded. If I would be able to expand this to other countries, then it would be an additional grace. I promised my country from the very moment I entered my national competition that I would try my very best to be the finest ambassador for my country, and this is exactly what I intent to do. If I would be honored to win the Miss World title then I would keep the same promise. It is a privilege and I intend to cherish every opportunity. I also look forward to meeting the other 120 other girls and enjoying a long friendship and experience that will never be forgotten in a lifetime. I would like to thank all the support from many different individuals, the organizers, friends and my family who have made me what I am today and kept on supporting me throughout. Personal Motto: Every day is a chance to smile and make others smile with you!